Videos appeared on the web showing a peaceful protest in Berkeley that was attacked by people wearing black clothing and masks. People gathered in Berkeley, California, at an anti-hate demonstration. The California demonstrations took place only two weeks after a far-right rally in Charlottesville, Virginia, ended in tragedy, as a car slammed into a crowd of counter-protesters, killing one woman. Shortly after beginning, the crowd was suddenly attacked by black-clad people (claimed by eyewitnesses as anarchists and antifa) near the Martin Luther King Jr. Civic Center Park. Wearing black clothing and masks, attackers stormed the demonstration and attacked several supporters of President Trump. Berkeley Police Chief Andrew Greenwood said officers were told not to actively confront the anarchists. 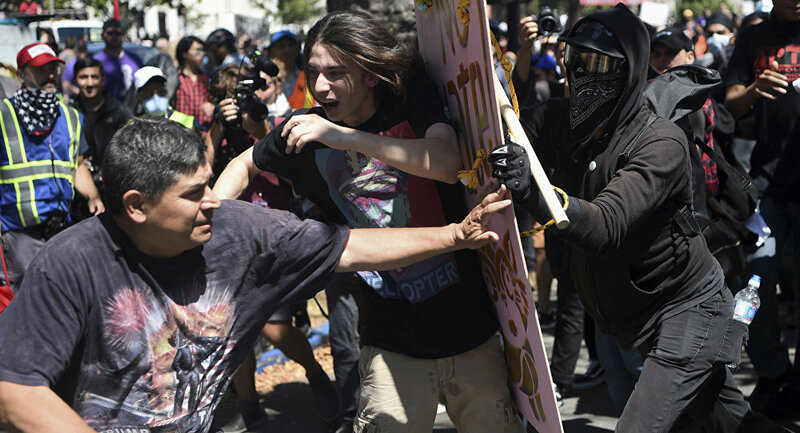 ​Later it was reported, that California police detained 13 people, as a group of anarchists chased away right-wing demonstrators and attacked reporters near the Martin Luther King Jr. Civic Center Park, according to local media. The recent violence has sparked outrage among Twitter users. #MorningJoe rippin on Berkeley, ANTIFA, snowflakes, Dems, & demanding free speech. Check the temp. Hell has frozen over. I am denouncing Antifa. We don't want you on the left. We are for peace, you are not. What happened in Berkeley CA was shameful.